Seiki SE50FO03UK review | What Hi-Fi? Seiki, in case you’ve never heard of it, is a Chinese-owned brand that has made a splash in the US selling inexpensive TVs and monitors. It is currently trying to break into the UK through supermarkets and online retailers. We have encountered the brand before when we reviewed a one-star Bush 4K TV, which was a rebranded Seiki. The low price was a big draw but it ended very badly for all concerned. Now we have the company’s flagship Seiki SE50FO03UK and are hoping for a better outcome. 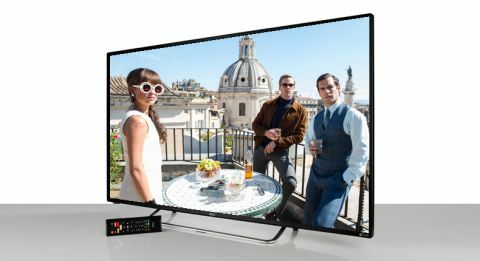 What we have here is a 50in Full HD (1080p) TV for £380. Seriously, £380. Is there a catch? Of course there is. We were all fired up about that pricetag, but our enthusiasm is short-lived. The trouble begins as soon as we power up. Out of habit we head straight for the settings to calibrate the picture, or nose around the menus and various smart functions before calibration. But even at this stage, we struggle with the screen’s severe lack of urgency. Navigating menus is a chore, as button presses work best at one-second intervals. Dare to nudge the cursor repeatedly and you are likely to be ignored. The remote control doesn’t help either. The buttons, while big and clear, are spongy. The amount of travel you undertake per button press, coupled with the number of times you have to press to get a response, makes using it very frustrating indeed. Then there’s the curious layout of the remote. Seiki has added a QWERTY keyboard to the back of the device, which is accessed by opening up its shell and flipping the top half over. While that’s fine for adding passwords, it is a nightmare for the simple task of typing in numbers. Want channel 102? Open, flip, press a button to put the remote into number mode. Now find the numbers themselves, lurking behind some of the letters in blue-on-black. Good luck doing it in the dark. The smart offering here is very basic. At the time of reviewing the Seiki, there were very few apps, with BBC iPlayer and Netflix being the only highlights. There is no marketplace to download more. You could say it’s simple, but we’d call it limited. Seiki says it manages what’s available now, and will add more in the future. We have to hope this happens, because currently there are TVs from 2011 that have more smarts to offer. So far, not so good – and we’ve not even started on the performance, which is disappointing. It’s an unsubtle picture with poor contrast and juddery motion. Both Full HD and standard definition are low on detail, colours are unnatural, and there is a noticeable amount of noise. The calibration settings do little to help, and while anti-noise is available, it just smoothes out what is already a vague picture. But if the picture is disappointing, the sound is flat-out bad. We’ve heard our fair share of thin sound from thin TVs, but this is often shrill enough to make bats wince. There are tone settings, but these do little to improve the quality. We have seen a few budget TVs – cut-price, cheap, or whatever you want to call them – in our time, and are no strangers to excellent ones from brands we had never heard of. Unfortunately, this is not one of them. This is a TV we would have considered poor even three years ago. Unless you're desperate to make a saving, this is best avoided.